The party-hearty crowd put the Thai island of Koh Phangan on the international tourism map, but those involved in the island’s tourist trade say there are weeks of blissful peace between each raucous gathering of thousands of young people. Koh Phangan is best known for its monthly, long-running Full Moon Parties, which in turn have spun off other monthly celebrations, including the Half Moon Party. “Everyone knows Koh Phangan is a party destination,” says Siranee Anuntamek of the Koh Phangan Hotel & Tourism Association. But tourism officials, aware that many Thailand visitors who are seeking a quiet, idyllic vacation might be leery about visiting an island famed for hard partying, are quick to point out that the parties are held in a bay on the southeastern shore that’s secluded from the rest of the large island. know the Full Moon Party was happening,” says Kayla Shubert of the Tourism Authority of Thailand’s Canadian office. Koh Phangan is actually 187 square kilometres and has some 227 hotels, including five-star properties. “They [tourists seeking a restful vacation] can relax on Koh Phangan,” says Jaruporn Phoolsawad, who notes that not only are the parties held in a somewhat isolated locale, but that site is also quiet during the day. Phoolsawad says Koh Phangan deservedly attracts honeymooners seeking quiet holidays, along with retirees and families. None of those categories would be drawn to the island if the parties were inescapable, tourism officials note. 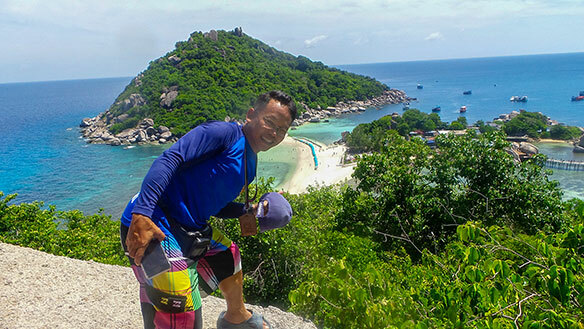 Tourism officials promote Koh Phangan as a particularly scenic, mountainous part of the world that offers visitors a range of activities, including snorkelling and other water sports, cycling, yoga and hikes that enable visitors to experience Koh Phangan’s natural side. Visitors will find white-sand beaches, waterfalls, jungle and Buddhist temples on the island. “We definitely call it greenery island,” says Limsuwan. More information is available at www.kohphanganhotelassociation.com .